The Eccentric Exercise Protocol for Chronic Patellar Tendinopathy: What exactly are "eccentric" exercises? What exactly are "eccentric" exercises? "Eccentric" muscle contraction refers to the lengthening of muscle fibers as the muscle contracts. This is the opposite of a "concentric" contraction, which occurs when the muscle shortens. Studies indicate that eccentric training may help promote the formation of new collagen. Research also shows that for patellar tendinopathy eccentric exercise is far superior to concentric exercise. Unfortunately, studies also indicate that excessive eccentric force is what can lead to a tendon injury in the first place. So, it is interesting that eccentric exercise can help improve the tendon problem that resulted from excessive eccentric force. Because eccentric exercise can be harmful when done too aggressively, it is essential that an appropriate protocol is used. Adding too many repetitions and/or too much weight too quickly can lead to relapses. This is why one must err on the side of caution by adding very small increments of weight over time. 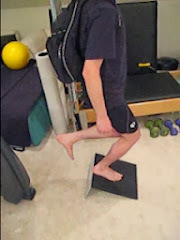 I've learned through trial-and-error to be careful in doing eccentric exercises. That's why my protocol requires many months of dedication, adding 1/2 pound weight increments every four days, so long as there is no increased pain.